Have I Found My Lands of Forever? ⇒ Have I Found My Lands of Forever? Through the darkness there was a stir as a creature embarked through the forest. Little whispers that echoed through the leaves and bounded back against their mossy trunks filtered through the guardian's clouded lobes, which twisted and turned this way and that to make out the scenery that lay before him. To others, this guardian's journey would have felt like the world had worn down their mind and body to its core, leaving nothing that would give him revived invigoration, yet his youth deceived this. To him, it was merely a fallacy to say that a creature had wandered hundreds of leagues simply to find their desires. After all, he was young. He was proud. And he was strong in mind and body. "Andash was right... Perhaps this is where I can find my destiny." His name was Karalius, a self-crowned "king" of his own body. He ruled nothing other than himself, and his regality was pure pride of his own self-confidence. Little of his appearance, nor of his demeanor suggested an emotional wreck, nor a charming sweetheart. He was surely a brute in nature and in physical appearance. And Karalius again scoured the landscape to justify his own words. The trees were hung with the aging leaves of a dying year, the ones that fell letting the slightest crunching noise omit underneath his dark daggers. Yet the grass still seemed lush and enticing, as did the smells and sounds that he sensed. As he continued to strut through the foliage, his orbs bounced back and forth, seemingly searching for life. Kahlua, their Queen, had told her that the Worlds Edge philosophy was peace and unification between all the herdlands through any and all strife. Imagine Leeka's disappointment when all that proved to be a conditional statement. But of course, she couldn't be too angry.... could she? The circumstances were after all quite extreme and downright grim. No one would feel comfortable while in the hunting grounds of a deceitful and altrox luminary. What she did once, she could do many times over with out regret or fear. Of late, a dangerous and errant thought raced across her mind. I wish Gods could be put in their place. I wish it weren't so easy for them to mess up our lives. Of course, Leeka knew this was entirely rash of her to think and knew better then to muse on matters out of her control, however they begged otherwise. So instead, Leeka had caved to another sort of impulse and made up her mind to go to the Hidden Falls. Not to stay, just to see it while the gates were open. There had been a few times when she was supposed to have gone on emissary missions there but one thing or another prevented her from going. In this her curiosity egged her own, temporally trumping whatever bitter reproaches lingered in her spotted body over the whole war. Thankfully it had been a swift ordeal with little injury to report on their side. Of the true Hidden Fallers and how they fared, there was little that she knew. At least her herd wasn't imposing a mass exodus on the residents. The Edge simply wanted a place they felt safe in and were willing to annex anyone who wished to remain under the new leadership. The choice was theirs to make. That at least is peaceful, I think. Leeka paused in her steps then, creating an empty silence all around her as deep as her thoughts while she breathed softly, zoning in to the scents and sounds of the copper wood. Moist damp earth invigorated her senses as she noted the grove of grand white oaks she had stumbled upon, each one dressed in ivory bark and rusty leaves. Beautiful. She would have spent longer observing them when her attention was caught by the sounds of steps rustling nearby, her twin audits swiveling to its source with interest. Having stopped Leeka knew that they were not her own and realized with a bit of a jolt someone was close. Turning her head that's when she caught a glimpse of shimmering gold between the boles of the oak trees further away. Instantly the young mare's thoughts went to Midas, the former leader of the Hidden Falls. The stallion's association with gold was as near legendary as the Sun God's but when she failed to denote wings on the stranger both those notions were tossed out. This was someone else. Someone new perhaps. Leeka didn't know why but she was suddenly met with the urge to intercept the stranger. While recruitment for the herds often occurred in these parts, Leeka wasn't motivated for that right at this moment and besides, let's face it, the Worlds Edge not was a prime location to be at the moment. She just wanted to meet whoever was there. Perhaps it was out of a sense of duty, to warn them of the comings-and-goings of the land. Turning about, Leeka trailed after the figure till she found them again not far off. And what a looker. It could be said that Leeka was momentarily swooned by the handsome stranger and his majestic presence but she just as quickly snapped herself from it as she fell under it. " Hail, stranger." She said lightheartedly as way of greeting. " Are these woods new to you? Regardless if they are or not, you've come at a beautiful time in the amber season."" A beautiful time. Not the words she would use to describe recent events, but for the woods themselves it worked just fine. Things changed, the seasons changed, we all grew up, flowers bloomed one minute and the next were closed up and ready for hibernation. Just like the rest of the world, the herds of Helovia changed, leads, gods, members, numbers, allies, peace, war, it all changed and once the change was completed life must go on and so it did. Chesnut harks flicked effortlessly on my painted skull while I traveled through the ever familiar lands of Helovia, towards the Threshold where I could find new bodies to bring back to our new home. White painted limbs cut through the slowly browning grass of Orangemoon and the piles of fallen leaves while I moved out of the labyrinth of the Falls towards the thickly wooded claiming grounds of sorts, thoughts of what strange creatures I would bump into on this brisk day flitted through my mind like butterflies. It didn't take long before I found myself in the midst of tall, thick trunks that welcomed newcomers into the lands of Helovia. These trees did a good job of leaving the newcomers confused and lost at the gateway until a more knowledgeable creature came along to sweep them off their hooves and carry them home where they could be warm and safe again. Orchid hued pools of crystal moved with ease, taking in the different sights that were so familiar to me, but easily terrifying to someone who had no idea where they were. Excitement flooded my blue blooded veins as I wove between the trunks, normally I wasn't much of a talker. Social situation and I had an uncomfortable relationship, but today I was looking forward to seeing a new face and meeting someone who didn't know that I had left my herd when they needed me only to return once my mind was put back together. To this newcomer I would just be a smiling face that greeted them at the mysterious gate of the even more mystery filled lands. The gentle tones of a mare speaking caught my attention, breaking through my thoughts and bringing me crashing back to reality enough that I could alter my direction enough to find myself standing in the company of a gold stained grey and the painted mare I had seen a time or two in the mists of the Edge. Heartstrings panged painfully as memories of the beautiful lands that had once been home were pulled to the front of my mind, but getting to move was a blessing in disguise. There I could leave behind the memories of all that had haunted me and start fresh with a somewhat new outlook on life. A soft smile tugged at the corners of my rosy kissers while my gaze switched between the two. "Osda sunalei. I am Cheveyo of the Hidden Falls. I take it you are new to these lands? "The transition from my mother tongue into Helovian was graceful and easy as the words slipped off of my vocal chords into the briskly cool air of autumn. Clearly the paint was a lost cause, as her heart was already tied to the Edge...but the tall grey stallion would make a good addition to the Falls. A powerhouse such as himself needed to be in a herd of war champions not one of gentle-hearts. "Good day to you, stranger. I am indeed new to these woods, but I have heard a lot of this land's desirables." He tilted his cranium, "I do find this time of year a rather mellowing one, myself." At the same moment of replying to this stranger, another moved out of the blur of his golden orbs and into focus. Again, a dame had come to his rescue so to speak. And yet again she was a patterned creature, much like the one who had arrived before yet bore the symbols of which he was accustomed to. If not for those symbols, he thought amusingly to himself, they could almost be from the same nest. How... fulfilling. The second stranger spoke, much of the same content bearing questioningly at him. Karalius knew it would be impolite and ungentlemanlike not to recipricate to the other 'twin'. "I am indeed new here, miss. I had caught tales of this land along my trip here." Swiftly executing a turn on the spot to attempt to face both the pretty dames that had come to aid him, the proud brute flexed his rippling muscles and the gold and clouded pelt shone in the fading sunlight as it briskly retreated behind the trees and into the darkness. Here was where his journey had brought him, and he in turn questioned the strangers, both with the same question, "And where do I travel from here?" Leeka cocked her head a bit with pleasant surprise as the grey stallion answered her. So he knew something of Helovia? Not many had ever heard a whisper of this place before stumbling upon it as she had some winter years before, but at the same time it was hardly a secret. The young mare found herself impressed regardless and quite excited by the thought of someone versed in their ways. Of course, that might be granting him a little too much credit. Whatever he knew could just be a collection of stories riddled in myths. Myths made real. she thought to herself idly. She was about to continue on when footsteps again riddled its way into her hearing and neither her nor the grey stallion was moving. Eager to see who else was near Leeka's bright emerald gaze scanned the premises for signs of movement. Who else was coming? 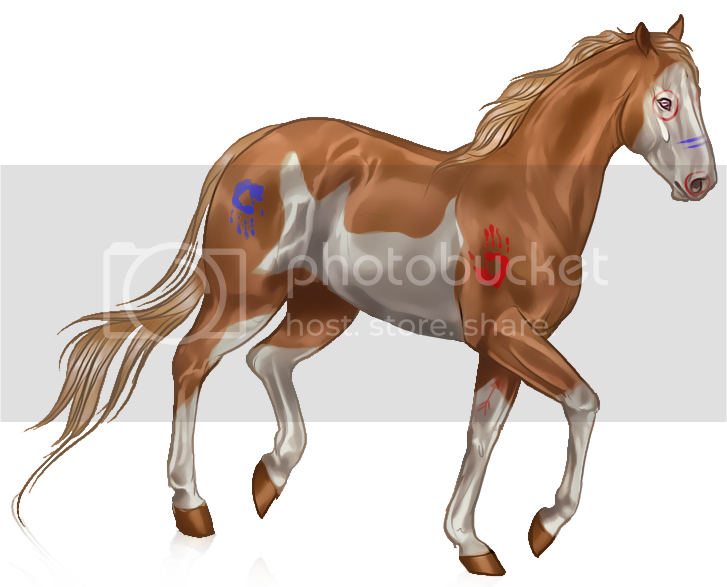 The mare's eyes widened excitedly with recognition as another mare entered onto the scene, a proud chestnut paint bearing exotic tribal markings. Leeka was hardly acquainted with the warrior-mare but knew of her from various herd meetings when she had been promoted to Captain. Her heart sunk, however, when the mare introduced herself as being from the Hidden Falls. She had actually been insulted, momentarily forgetting recent history and almost made to correct her and say that she was from the Worlds Edge.... but then she remembered. Leeka hoped desperately the disappointment didn't show on her face even as the faintest of tears threatened to burn in her eyes. When everyone had begun to leave Leeka had hidden herself away on the beaches below the cliffs, unable to watch as one by one they left the Edge to move onto the next, forced to forsake it because of the terror of the Moon Goddess. She didn't blame anyone... She understood why....it just...it just hurt to be reminded and to know how everyone else must feel. Leeka once already suffered the heartache of losing Eoroleen to shadows. She wasn't about to let them do so again, not if she could still piss in their face by staying. Thankfully, no tears none came to fruition from the threat and Leeka smiled genuinely at Cheveyo. She was actually happy to see her, regardless of the circumstances. " Nice to see you again, Cheveyo." She said, bowing her head to the former World Edge protector before turning her attention to the grey stallion. " So do you know you're in the Threshold of Helovia then, good sir? Not many do when they find themselves here. As to where to go, there are many places to choose from but you can go–" "she paused suddenly, almost choking on the word for the briefest of seconds. She was about to say 'west, to the Worlds Edge' but how could she dare offer that? It was far from sanctuary and it would mean explaining so much. So much that she didn't want too. Maybe in privet she could have pushed through it, but certainly not in front of Cheveyo, a former Edger. Just because she was going back didn't mean others had to follow. In fact, it was better they didn't. She was dancing with death after all, but, hey, it was her choice. "– north," she said, emphasizing the word with the barest hint of gravity but otherwise carrying on seemlessly. "With Cheveyo to the Hidden Falls. Many positions to be filled, many things to see. A labyrinth of waterfalls, so I'm told." " Did it show in her voice how it pained her, to speak of this other land as though it were suppose to be home? Leeka thought she spoke well enough, if a bit quiet for her usual self. She didn't fault Cheveyo at all for her choice, just as she hoped the mare didn't think harshly of her weakness either.
" I'm Leeka, by the way." she added after a moment, realizing she hadn't mentioned it before to the grey stallion. ""And you? You can't be a stranger forever."" Colt ambled through the Threshold, her body tense and eyes darting to every direction. She was on alert, stalking through the forest eagerly, awaiting the arrival of a foolish mutt who thought she was coming for them. Stupid. Voices can be heard, a conversation already begun with what sounded to be at least two others, her ears pricking forward Colt moves in, steel sights locked onto the group that gathered beneath the safety of the undergrowth. A smirk crawls across her lips as she does a sweep of each body, a flaxen mare with intriguing painted markings, a bay mare who was a mess of ebony and alabaster, and a golden flecked stallion. All were equines, how delicious. Stepping forth into their fields of vision, she gives them all a nod in greeting. "Am I late to the party?" She murmurs to no one in particular, her greediness for all three equines consuming her as she stands between the two mares. What a lucky man, she thinks, wondering how surprised he must be to by wanted by not just one mare, but three. "I'm only here to tell you a few things, since I don't believe in toddling aimlessly and explaining where I reside over and over again, nor do I want to say more than I have to." Blunt, straight to the point, perfect. "I'm known as Colt, and I lead an outcast band. Whether you'd like to join me or not is up to you, I can grant you time to think about joining me, if you so need it." A pause, lips pressed closed as her thoughts whirl and mind clicks, trying to arrange what more she could say. "Because I can't trust any of you, I will not give you any information about my group unless you show an interest in joining. Just know, we do not take the weak or sickly, and those unfit to fight will not be accepted." Clearing her throat, Colt glances at each equine individually, taking note of each. The ebony girl looked weak and soft, as though if you shouted at her and she would collapse into tears and uncontrolled gasps. The flaxen looked more hardy, but Colt still doubted her abilities. And then there was the stallion, tall, slender yet stout, he seemed like a good candidate for the Empire. "This invitation goes out to all three of you," she concludes, eyeing them and eagerly awaiting their responses and reactions to her briefing of the Empire. The Equine Empire wants YOU! Assuming you refers to an equine. I seemed to have shown up to the party at the awkward moment when everyone has already introduced themselves and I am left standing in the corner sipping on a jack and coke waiting for someone to walk up to me. Thankfully it seemed like the other paint recognized me and a gentle greeting was tossed in my direction, only to be returned with an awkward smile and a quick nod, small talk had never been my area of expertise. Luckily the grey stallion seemed to have at least a small bit of manners as his molten pools turned to meet my own orchid ones before replying easily to my question. "I am indeed new here, miss. I had caught tales of this land along my trip here." Sun stained harks flicked forward as I listened carefully to the words of the gold marred, it seemed like the popularity of Helovia was growing steadily if this handsome stranger had heard of it in his travels. Before I had a chance to speak up and ask the newcomer of his origins he had turned so both Leeka and myself would be in his line of vision before another string of deep lyrics drifted into the brisk Orangemoon air. "And where do I travel from here?" The movement of another dark form peeling out of the shadows, uncomphrenable words falling from her sooty lips before she joined our slowly growing party. At least someone was later than I. Orchids moved to watch the red marked mare as she slid in between Leeka and I before opening her mouth again. "I'm only here to tell you a few things, since I don't believe in toddling aimlessly and explaining where I reside over and over again, nor do I want to say more than I have to. I'm known as Colt, and I lead an outcast band. Whether you'd like to join me or not is up to you, I can grant you time to think about joining me, if you so need it. Because I can't trust any of you, I will not give you any information about my group unless you show an interest in joining. Just know, we do not take the weak or sickly, and those unfit to fight will not be accepted." Curiosity sparked momentarily in my painted frame, an offer that the old Cheveyo probably would have accepted readily. Excited to show off her strength and poweress, now I was ready to settle down and work on healing others rather than tearing their limbs off of their bodies one by one. Bobbing my whitewashed skull once in a greeting I smiled warmly before vocal chords shook happily. "Pleased to meet you Colt." My attention turned back to the reason we were all here in one place just as the bay paint spoke up once again, I supposed to try her own hand at recruiting the stallion.
" So do you know you're in the Threshold of Helovia then, good sir? Not many do when they find themselves here. As to where to go, there are many places to choose from but you can go–north." 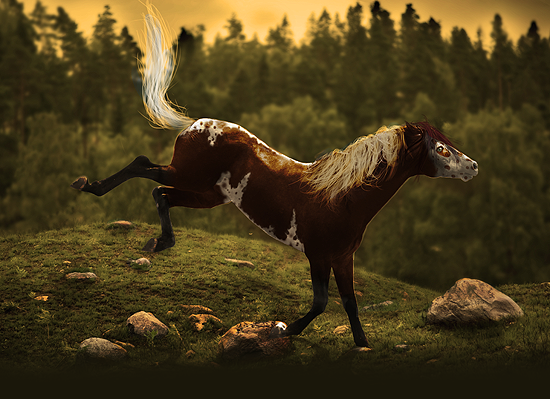 I couldn't help the shock that bubbled up inside my blue blooded veins, Leeka wanted the stallion to follow me back to the Falls rather than back home to the Edge? My skull tilted ever so slightly as I twisted to be able to look at the other paint around Colt's dark body while she continued to speak. "With Cheveyo to the Hidden Falls. Many positions to be filled, many things to see. A labyrinth of waterfalls, so I'm told." I swallowed the lump that had began to form in my throat, the ghost of a smile tugging at the corners of my rosy kissers at my former herd-mate. We hadn't gotten to know each other while we lived together, but she seemed nice enough and clearly had strong ties to the Edge otherwise she probably would have left with the rest of us. "She's correct, if you like waterfalls and plenty of spaces for personal time the Falls is for you. As wonderful as Colt's idea sounds I haven't heard of many Outcast bands that have done well as of late, so it depends more on how stable of a life you are looking for." My painted shoulders rolled up into a shrug before I spoke once again, this time speaking kind words on the half of the Edge. "Although, I wouldn't knock the Edge out of the running either. It's a beautiful land, mist and cliffs and plenty of trees to explore. So I suppose it's all dependent on your preference. The Edge worships the Moon who happens to not be in the sky at the moment, the Falls worships Earth, and there are two other herds that worship our other gods." I flashed a warm smile in the stallion's direction hoping I hadn't just confused him even more. Notes | Sorry I took so long guys! Karalius spotted the tilted cranium of the first who had come to meet him, with what he sensed was a positive reaction to his reciprocation. I wonder. The buzz of excitement that rippled off her body was something that the proud brute sensed immediately, although for what purpose she did this remained a mystery to him. As he felt the dying year's breath blowing into his dappled pelt, he gazed at the new world in all its splendour of Orangemoon. The greens, oranges and browns that culminated into one season had focussed themselves on this one patch of territory that felt like a gateway into a new world. Whether this world was bountiful and beneficial to the brute was yet to be discovered. Yet turning his attentions back to the two dames, he got the impression that they knew one another, which was only proven right by the greeting to the other. So that one's Cheveyo, he thought with an emotion that would be deemed creepy to anyone who would be able to read his mind. 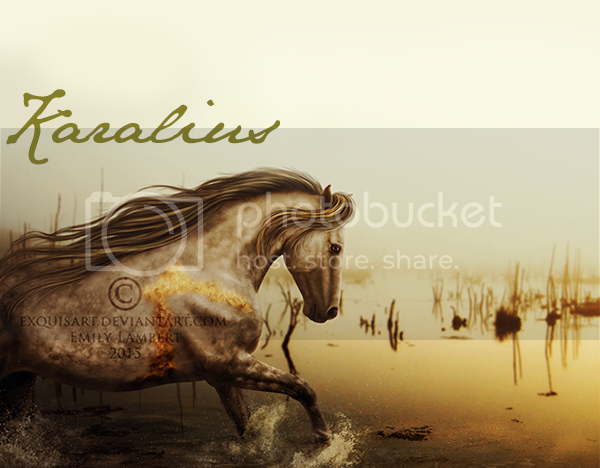 Karalius was not one to form emotional attachments, just the impulse of a pretty face. After listening to what the dame had to say, he came to learn the name of his aid: Leeka. It never occurred to Karalius that there had been hesitation in the dame's voice when guiding him about this land, Helovia. He tilted his own cranium in interest at the thought of settling here in whatever corner of the land that he thought he would make a difference. The brute was certainly not a patron saint. By making a difference he meant chaos, a pleasurable atmosphere to be in, an even more pleasurable action to create. "I have come across word of this place and had to see for myself," he retorted in a deep and charming tone towards Leeka, "I am merely a traveller in these part. North you say? The prospect does sound rather... tingling." He smirked, his velveteens giving only a hint away of his mischief at play here. He flexed the strength underneath his bodice in his pillars as the time stood there made them stiff. Releasing the weight of his own pressure for a second invigorated him with more life to continue, "It is an honour, Leeka. I am Karalius and hopefully will become less of a stranger in these parts-" the brute felt cut short in his flirtatious makings towards the pair, to see yet another dame come his way. Yet there was something oddly different with the one that came forward. Her brindled pelt of charcoal and tan, bearing a tangle of tassels upon her bodice a stark contrast to the pair of multi-coloured dames that had originally come to his aid. The proud brute could sense by her rigid movements that she was here for a purpose, much unlike Cheveyo and Leeka. A purpose that was too great to ignore for Karalius. In the midst of all that was going on, Cheveyo raised her voice in his direction to add more options to the table, giving a slightly more indepth look into the nature of what he could have in store for him. As he listened to her explanation, the clouded brute breathed in deeply, the sort that would give away his intent concentration on the task that lay before him: his destiny's path. Sure, it would be possible to turn around and change his mind at some point, but now he had to make the decision once and for all. Karalius' daggers unconsciously disturbed the ground with the shifting of his weight as he thought, the Edge and Falls are good, but will they give me opportunities? Whilst having been listening to the proposition that was being set before all of them by Colt, Karalius felt a distinct pull towards whatever it was that was being proposed by this Colt. Judging by his interest towards it, he already guessed what his life in Helovia had in store for him, and it made me happy. He then turned back to the dame herself; what a name for such a creature, he thought idly to himself. In the midst of her speech, the talk of fighting and secrets ebbed at him and almost egged him on to jump at the chance to hear what Colt had in store. His lobes pricked forwards towards her, and he dipped his head in a polite greeting only it was too quick to be considered anything other than excitement. With a glow in his golden orbs he ushered a reply towards her with a great sense of purpose: "Speak, Colt, for I am listening to this. I would be willing to hear what you have to say if it involves such activities." There seemed like several options he could take at this point, all viable and possibily opportunistic to the desires and ambitions he saw for himself. But this was what the brute had come for. His destiny could be made by what the tawny dame was offering to him. She could tell by the faint gestures on the chestnut mare's face that she had surprised Cheveyo and surely she must be left wondering what exactly her intentions were. Simply put, she didn't think it was right to invite someone into the homeland when everything was so unstable. Even when Cheveyo made the effort to offer the Edge in her stead, Leeka couldn't make herself agree with the sentiment. The Edge was about peace and sanctuary...and it had betrayed that concept thanks to the Moon Goddess. What kind of place was that to introduce to someone? The Edge wasn't what it used to be and it was uncertain as to what it was to become. Not even Kahlua, their...former Queen would be staying behind to guide it in the coming days. The new leadership of the Edge had yet to be decided but the days till that choice were waning. Not even those who had called it home remained behind to influence its revival. Everything was on shifting ground. Maybe, in time, if things came together again like they were, then – and only then– she would preach about their home proudly...but not today. Leeka could not see clearly what the future held. She could not see the path to rebuild what was lost and feared what might be created from the fragments. Could she be blamed for her doubt? In return, Leeka offered a solemn smile back at Cheveyo as the mare's head tilted, doubtlessly in question. It is the right choice. She almost made a motion as if to speak and explain herself but the action was interrupted when another voice broke out into the air, announcing the arrival of yet someone else. Someone else that she found herself almost instantaneously disliking. What sort of demographic was that? After the 'war' with the Hidden Falls Leeka had had her cut of fighting, whatever the reasons. To her, the same could have been achieved if they had just asked or moved into an unoccupied part of the Wilds but she could not undo what has been done. To find that there was a group out there with apparent focus on this, well needless to say it hit a sore spot and raised her suspicions. She could of course just be thinking the worst. Outcast bands were odd, as far as she understood them. They weren't quite like herds and varied wildly in their purposes. This interest in fighting could be little more then a sparring club, but the roan's words implied a less then innocent intent. Colt had after all divulged nothing of her band and simply stated that she couldn't trust them unless they showed interest. It left one to wonder why'd she'd be elusive like this, perhaps it was just a pitching strategy? Whatever the case Leeka intended to use her 'invitation'. Karalius seemed to share a similar thought as well.
" I'm not against listening, either." If only to warn others of you in the future, if need be." I've always wondered at the lives of outcasts, if that's what you like to call yourselves." Who knows, if things in the Edge continue as they are....she...might have to be one. How she prayed for that not to happen. A harsh gaze is upturned towards the flaxen, ears laying against her skull as her steel sights target the chestnut body. How dare she say that not many outcast bands have been fairing well, that'll draw them all away. Forcing a grin, Colt offers insight, trying to fix what she had ruined. "Well, my band has only just begun. Many of us don't want anyone trailing our every move, considering us threats— and I'd prefer if you.. not spread word about us." Her tone drops, sinking beneath their solid hooves as they gather round. How silly, all coming here for the same reason, to take whatever scraps they could find and carry them away to some over dramatized land that was not at all what it seemed. Colt would tell them the complete truth about her Empire, at least the basic details of it. Oversharing would prove fatal to herself or those (Diesel) already belonging to her Empire. All urged her to share, the dapple the first to ask, the alabaster spotted mare giving her own interest. Colt felt overwhelmed with all the curiosity, but elated by the fact that they wanted to know, all interested in hearing her tell of her grand Empire. "If you wish I tell you more, I shall. Spreading of this information however—" A brief, dramatic pause. "Won't be tolerated." She looks up at those gathered, frustrated by her lack of vertical aptitude. It was infuriating to her, the annoyance of having to look up at all your subjects rather than down upon them. "We are a band, devoted to serving justice, to training strong warriors and skillful spies. We provide a suitable home for soldiers and intelligencers alike, and even provide training for those unskilled. We all work towards one main goal," A wicked, twisted smile. "Such a goal cannot be revealed to strangers." She murmurs, eyeing them all with an untrusting eye. Revealing secrets to them was far from what she wanted. Karalius felt the excitement well up inside his broad, tapered frame: this is my destiny, he repeated to himself. Perhaps this truly was the moment that he started anew, a fresh beginning where he could go only up in the world. But his thoughts were soon brought back down to earth by the feeling omitting from Leeka. The painted dame seemed strained at the thought of something, but without being of the ability to read minds the clouded brute had to deal with the fact that he would remain out of the loop on what was going on. This frustrated the proud brute - Karalius was not one for keeping his velveteen out of other people's business, especially if it meant gaining knowledge or the opportunity to better himself. All of the equines' attentions were brought back to the small framed Colt, who had been giving her description of what was in store for them if they were to become part of her cohort. Her cold stare from the powerful orbs she possessed licked at Leeka with a hint of aggression that was only too noticeable. Her cranium arched back at the words were recipricated with an equally menacing tone towards the paint. "You need not keep such information from me, Colt. Consider me as not a threat, but perhaps an asset should you find me worthy to hear what you have to say," his tones were polite yet still bore that excited manner, "and nothing would be uttered from myself of this information..." His own deep voice trailed off, the sincerity in his voice taking stance towards the end of his meagre speech. The young man moved gracefully, through the threshold he goes. He isn't leaving, no. He is only wandering, observing the newcomers with bored amusement. There they all go following the others like blind sheep. And the one I was observing was the worst of all. In front of me stood four Equines, discussing some kind of band. The stallion was the obvious newcomer, and the one talking was a pretty mare, stockily built, speaking of her band. Her goal however, was not revealed to anyone. While she kept such a thing under locks, of which I commended her form she was still very open about her band, speaking of justice being served... But she didn't seem like the type to serve justice in the correct way. No, justice meant doing the right thing even if it hurt, helping for the good of others... No, her view of justice was skewed, blinded by cold revenge. Revenge was not justice, and sadly most confused the two. I watched them, discussing among themselves, and the male makes his choice. He will follow the mare blinded by revenge, to whomever that might be. My stomach rolls in disgust, and I roll my eyes. I was done here, but the mare was an idiot. To speak of such "secret" things in public was just asking for word to get spread. She would learn though. But for now, I had real justice to serve. To warn everyone else of a revenge driven maniac and her band of dogs. Slowly, quietly I back away, moving out of sight and hearing before moving at a faster pace, headed to the herd land one of my sisters resided at... Maybe she would listen to reason. Maybe, she wouldn't go after me with her bafoon growling behind her this time... Well this time I would be being much more careful, and I would not wander into any borders.